Summary: Learn how a simple change to a preference variable can help prevent accidental changes when using Windows PowerShell. One reason so many hands were up was that, when troubleshooting servers or attempting to repair servers that have problems, it is common to find a TechNet article that says open the command prompt and type these dozen cryptic commands and press Enter. It is not that network administrators are cowboys who go riding happily off into uncharted territory, but it is that they are put into the unenviable situation of having to make hard choices. Type the command and hope for the best, or suffer along and hope the server stays up for a bit longer. What if: Performing operation “Stop-Process” on Target “notepad (6052)”. As my student asked, what happens when I forget to use the whatif statement? Well of course, the Notepad process goes away, and there is no prompt, no anything. There’s not even any sign that the process no longer runs. The only way to confirm that Notepad went away is to use Get-Process. These commands and associated output are shown in the following figure. What if: Performing operation “Stop-Process” on Target “notepad (7840)”. What if: Performing operation “Create Directory” on Target “Destination: C:\fso4”. The above commands and associated output are shown in the following figure. 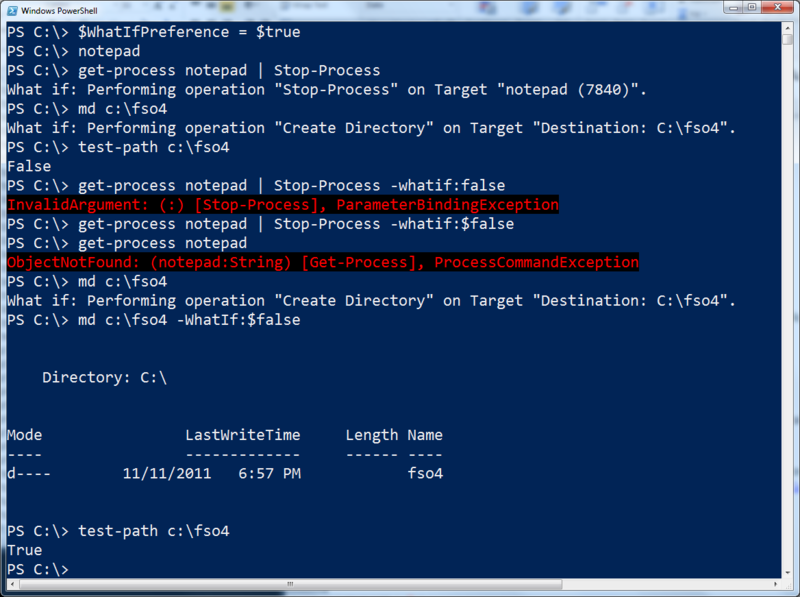 After I close Windows PowerShell and open it up again, the value of the $WhatIfPreference variable resets to $False. I no longer have the added protection of the whatif switch on by default. This appears in the following figure. The solution, of course, is to add the $WhatIfPreference to the Windows PowerShell profile. I have a number of Hey, Scripting Guy! Posts that talk about working with Windows PowerShell profiles or adding items to profiles. I also have an excerpt from my Windows PowerShell 2.0 Best Practices book that covers the different Windows PowerShell profiles. You will need to decide if you want to enable the preference variable on workstations, servers, or nothing—or for just certain users. Personally, I do not have it enabled on any of my systems, but there have been a couple of times when it might have come in handy. For highly available systems, it might be a very good thing to implement. That is all there is to using the $WhatIfPreference variable. Join me tomorrow for more Windows PowerShell stuff.